lower right: S. Lepine - 62. Georges Lutz [d. 1901], Paris; (Lutz sale, Paris, 26 May 1902, no. 97). Ernest Cognacq [1839-1928], Paris; by inheritance to his grand-nephew Gabriel Cognacq [1880-1951], Paris; (Cognacq sale, Paris, 14 May 1952, no. 42); acquired by (Alex Reid & Lefevre, London) probably for Capt. Edward H. Molyneux [1891-1974], Paris; sold 15 August 1955 to Ailsa Mellon Bruce [1901-1969], New York; bequest 1970 to NGA. Acquired by Molyneux after the 1952 United States exhibition of his collection. See letter from Molyneux to Ailsa Mellon Bruce dated 30 July 1955 in Gallery Archives RG39, copy in NGA curatorial records. See Ailsa Mellon Bruce notebook now found in NGA Gallery Archives. Paysages d'eau douce, Galerie Charpentier, PAris, 1945, no. 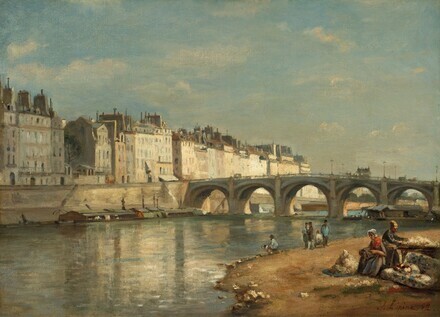 84 as Le Pont Marie. French Paintings from the Collections of Mr. and Mrs. Paul Mellon and Mrs. Mellon Bruce, National Gallery of Art, Washington, 1966, no. 66, repro., as Bridge on the Deine. Manet and Modern Paris, National Gallery of Art, 1982-1983, no. 7, repro. European Paintings: An Illustrated Summary Catalogue. National Gallery of Art, Washington, 1975: 194, repro. European Paintings: An Illustrated Catalogue. National Gallery of Art, Washington, 1985: 227, repro.